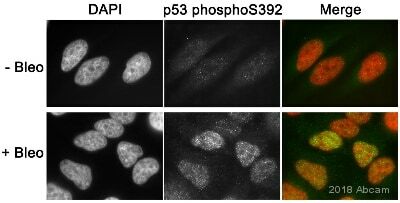 This antibody is specific for p53 phosphorylated on Serine 392. The mouse and rat recommendation is based on the WB results. We do not guarantee IHC-P for mouse and rat. Synthetic peptide within Human p53 (phospho S392). The exact sequence is proprietary. WB: HEK293, A431, PC-12, RAW 264.7, HEK-293 and MCF7 cell lysates. IHC-P: Human prostate adenocarcinoma tissue. IP: 293T lysate. Our Abpromise guarantee covers the use of ab33889 in the following tested applications. WB 1/1000 - 1/5000. Detects a band of approximately 53 kDa (predicted molecular weight: 44 kDa). For unpurified use at 1/80. Lane 2 : RAW 264.7 (Mouse Abelson murine leukemia virus-induced tumor macrophage) whole cell lysates, then the membrane was incubated with alkaline phosphatase. Immunohistochemistry (Formalin/PFA-fixed paraffin-embedded sections) analysis of human lung carcinoma tissue sections labeling p53 with Purified ab33889 at 1:250 dilution. Heat mediated antigen retrieval was performed using ab93684 (Tris/EDTA buffer, pH 9.0). Tissue was counterstained with Hematoxylin. ImmunoHistoProbe one step HRP Polymer (ready to use) secondary antibody was used at 1:0 dilution. PBS instead of the primary antibody was used as the negative control. Lane 2 : HEK-293 (Human embryonic kidney epithelial cell) whole cell lysates, then the membrane was incubated with alkaline phosphatase. Lane 2 : PC-12 (Rat adrenal gland pheochromocytoma) whole cell lysates, then the membrane was incubated with alkaline phosphatase. ab33889 (purified) at 1:20 dilution (0.6μg) immunoprecipitating p53 in 293T whole cell lysate. Lane 3 (-): Rabbit monoclonal IgG (ab172730) instead of ab33889 in 293T whole cell lysate. Lane 3 : A431 treated with 1µg/ml doxorubicin for 24 hours whole cell lysate, the membrane was incubated with alkaline phosphatase. Observed band size: 53 kDa why is the actual band size different from the predicted? Unpurified ab33889, at a 1/100 dilution, staining p53 in paraffin embedded human prostate adenocarcinoma tissue by Immunohistochemistry. Dot blot analysis of p53 (pS392) peptide (Lane 1) and p53 non-phospho peptide (Lane 2) labelling p53 (pS392) with unpurified ab33889 at a dilution of 1/1000. ab97051 (Peroxidase conjugated goat anti-rabbit IgG (H+L)) was used as the secondary antibody at a dilution of 1/100000. Lanes 1 and 5: Extract of Hek293T incubated with etoposide (7.5 µg). Lanes 2 and 6: Lambda phosphatase (400 times-diluted)-treated extract of Hek293T incubated with etoposide (7.5 µg). Lanes 3 and 7: Lambda phosphatase (100 times-diluted)-treated extract of Hek293T incubated with etoposide (7.5 µg). Lanes 4 and 8: Lambda phosphatase (25 times-diluted)-treated extract of Hek293T incubated with etoposide (7.5 µg). Lanes 1-4: Anti p53 (phosphoS392) antibody (ab33889, unpurified) at 1/2000 dilution. Lanes 5-8: Anti p53 antibody (ab1101) at 1/2500 dilution. Lanes 1-4: HRP-conjugated goat anti-rabbit IgG (H&L) at 1/10000. Lanes 5-8: HRP-conjugated goat anti-mouse IgG (H&L) at 1/10000. Blocked in 5% milk in PBS for 3 hours at room temperature. Incubated with the primary antibody in 5% BSA + 50mM Tris pH 7.5 + 0.05% Tween-20 overnight at 4°C. Incubated with the secondary antibody in blocking buffer for 2 hours at room temperature. Lane 1 : MCF7 cell lysate untreated. Lane 2 : MCF7 cell lysate treated with 5 ug/ml Actinomycin for 3hrs. Lane 3 : MCF7 cell lysate treated with 5 ug/ml Actinomycin for 6hrs. Lane 4 : MCF7 cell lysate treated with 5 ug/ml Actinomycin for 18hrs. Publishing research using ab33889? Please let us know so that we can cite the reference in this datasheet.